Venturi, Drip Irrigation System, Drip Lateral, Inline Dripper and Emitting Pipe Supplier & Distributor in Rajkot (Gujarat), India. 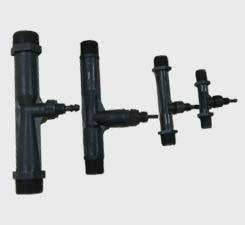 The best quality of Khedut Fertilizer Injector is that it does not require any external power. it works in an existing pressure of pumps. 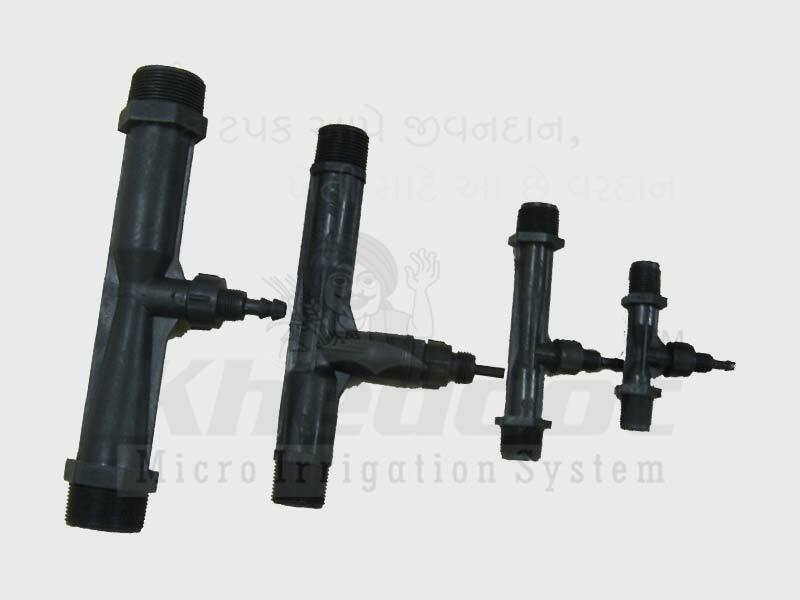 Safety from sunlight or heat : An Khedut Fertilizer Injector has been manufactured by using high quality raw materials and also by using high standard ultra-voiles materials, it is safe from sun heat. It also helps to increase its life. Rust proof : It is safe to use Khedut Fertilizer Injector Because water and chemicals do not affect it. Ad it is rustproof, it does not get correded. Therefore we need not replace it every now and then. Chemical Resistance :Chemicals like acids and bases do not make any adverse effect on it. So it lasts for years together. The cost of maintainance and repairs is very low. It is also more durable and strong hence no necessity of replacing it or repairing it and no maintenance is required. Khedut Fertilizers Injector works on pressure loss operation system. Hence it cannot work unless 0.5 kg pressure is reduced for 2" Khedut Fertilizer and 0.3 kg loss for the 1.5" Khedut Fertilizer Injector. 10000 lit. water is flown per hour with 2" injector. Hence it should be used where water available more than 10000 lit. per hour. Before using Khedut Fertilizer Injector cleanliness of Sand filter and screen filter is necessary. Khedut Fertilizer Injector cannot work if is choked up. For installing Khedut Fertilizer Injector the area of field should be even. If the field area is very high, then filter and injector can not be installed in lower area. In such a case Khedut Fertilizer Injector should be installed or irrigation point. Which installing Khedut Fertilizer Injector the arrow (→) should be adjested in the direction of the flow of water. We can install Khedut Fertilizer Injector on pipe lines of 4", 3", 2.5" or 1.2" measures. After installing Khedut Fertilizer Injector start the drip irrigation for 15 to 20 minutes. After exhaustion of air pressure in water, Khedut Fertilizer Injector should be started. We can install Khedut Fertilizer Injector in any position viz. Vertical( | ), Horizontal( — ), inclined( ⁄ ) etc. Backed by huge industry experience and market understanding, we are involved in manufacturing a wide variety of Venturi Injectors for our valued patrons. As a manufacturer need order quantity as per that.